Americans gave more than $298.42 billion in 2011 to their favorite causes despite the economic conditions. Total giving was up 4 percent from $286.91 in 2010. This slight increase is reflective of recovering economic confidence. The greatest portion of charitable giving, $217.79 billion, was given by individuals or household donors. Gifts from individuals represented 73 percent of all contributed dollars, similar to figures for 2010. 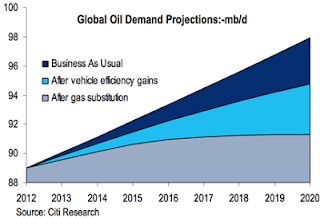 This anticipation of future gains in efficiency of use is a common thread to pictures of the future from the three major oil companies that I recently reviewed. All three, ExxonMobil, Shell and BP expect that energy efficiency gains will have a major impact on demand. BP, for example, anticipates that through 2030 energy demand will increase 36%, but that without this improvement in efficiency global energy would have to double by 2030. One of the problems in assessing the changes in efficiency over time is that, when looking at the past decade, one has to recognize the significant impact of the recession. 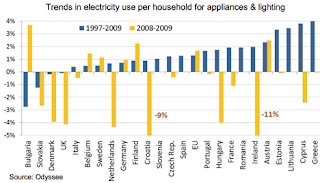 For example, the Odyssee project looked at energy use in Europe and clearly showed the impact of the recession on demand. What also caught my attention in looking where most of the energy savings were occurring was that it was in countries catching up to Western Europe, rather than in the more established West, and that when the overall savings are totaled these appear to have slowed significantly. 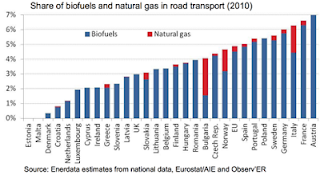 The second problem with the curve that Citi projects lies in the rate at which vehicles are switched from diesel and gasoline to natural gas power. There is currently an economic incentive in parts of the world to make this change, it currently sells at around the equivalent of $2.10/gallon in the USA. Yet it requires both infrastructure and an investment of capital to make the change at any level of significance. Nevertheless it remains a key ingredient of the Pickens Plan that Boone Pickens has been selling around the country for a number of years now. 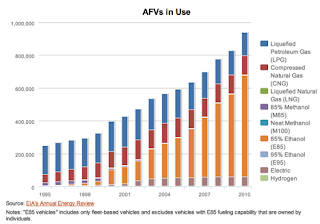 The fact that Clean Energy Fuels can list all 22 stations that added natural gas pumps along the “Natural Gas Highway” in the November-January period, does not indicate a great rush to build that infrastructure. It is easier to change the local distributor networks, with companies such as Waste Management indicating that they will use CNG in 80% of their new trucks, than it is to see the rapid change of the longer distance haulers, and for passenger vehicles. 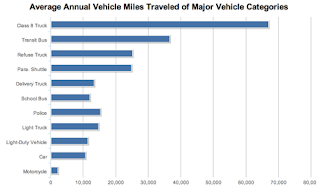 A recent article in the Washington Post noted that only 20,381 vehicles ran on natural gas of the 14.5 million new cars and trucks sold last year. Further not only does a CNG vehicle cost more to purchase, it also has a lower range, although for some applications that may not be much of a handicap. Yet, at the moment, it is the use of ethanol that is having the most impact on alternate fuel use. Other than that there has been little indication of much change in the market. 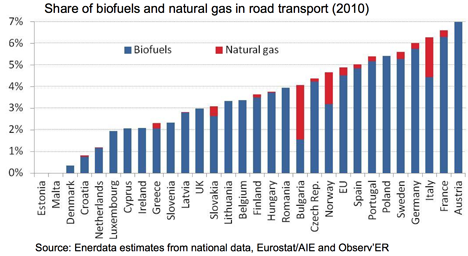 And in this regard Europe has also seen little movement toward the use of natural gas, in contrast with the use of biofuels, and neither has made large gains. The problem, of course, is that if these improvements in efficiency and switches to alternate fuels do not occur, then the demand will continue along the Business-As-Usual line, and, as BP forecasts, demand will double by 2030. The question as to what will be available to meet that enhanced demand remains one of the great imponderables that folk seem, again, unwilling to face. Certainly with a steadily increasing demand, and the constraints on supply that these pages have continued to document over the years, it becomes very difficult to see how price stability can be maintained, where demand exceeds supply at a given price. The problems that this will bring, particularly those nations that now subsidize fuel, a policy that is unlikely to change in Asia, are likely to be major. Yet for countries such as India, which last year has spent the allocated fuel subsidy budget for the year by the end of July the political costs of change remain very high and could well remain in place until the financial burden becomes intolerable. Unfortunately, with the current complacency, at that point it will then be too late to start searching for alternate answers.